The Vegas Golden Knights have gone from an empty expansion team roster to a cap crunch sooner than anyone could have expected. The defending Western Conference champs are enjoying another strong season and made a major splash at the trade deadline, acquiring Mark Stone and subsequently signing him to an eight-year, $76MM extension. GM George McPhee made the move knowing that the majority of the roster was locked up through next season and beyond and he would not be forcing anyone out by adding a $9.5MM cap hit to the payroll; or so he hopes. The other side of that coin is the lack of free agents who could depart Vegas naturally this off-season leaves little cap flexibility for the one major extension the team needs to make: top line center and impending restricted free agent William Karlsson. Karlsson, 26, bet on himself this past year when he signed a one-year, $5.25MM deal with Vegas following a breakout 78-point campaign. He hasn’t quite replicated those numbers this season, but with 44 points through 71 games, Karlsson is on a 51-point pace and has at least proven that he is a reliable contributor and will almost certainly be able to command a raise in his next deal, which is likely to be a long-term pact. The only problem is that CapFriendly currently projects Vegas to have negative cap space next season. Of course, this does not take into account a likely bump in the cap ceiling nor does it exclude the cap hit of the injured David Clarkson, but the Knights have joined the select few teams who are in a legitimate cap crunch, where the salary they need to add to complete their roster does not match up with the space they expect to work with. For now, McPhee is waiting to see what his options are before moving forward in talks with Karlsson. The Athletic’s Jesse Granger reports that the two sides have not talked contract yet and do not plan to until after the season. Even if early discussions go smoothly, that timeline almost assures that Karlsson will again file for arbitration and bad decision for the team side could cause major problems. As a result, Granger expects the team to work quickly to move out salary this off-season. In addition to Karlsson, Tomas Nosek and Malcolm Subban are also restricted free agents, while veteran leader Deryk Engelland and goal scorer Brandon Pirri are among the UFA’s they might be interested in re-signing. It’s a group of players that each made no more than $1.5MM this season, but new deals even at those same values add up in addition to Karlsson’s demands. Granger expects the Knights to have $5.75MM in cap space, which is likely not enough to re-sign Karlsson, nevertheless these supporting pieces as well. The team could also use an upgrade at backup goalie, moving on from Subban for a more established piece. So who could be on the move to help clear up space? Granger points to bottom-six forwards Ryan Reaves and Cody Eakin as the most likely trade casualties. Although Reaves is valued more for his checking game and willingness to defend his teammates, his nearly $3MM salary is hard to swallow given his paltry offensive contributions. Vegas could find a much cheaper option to fill Reaves’ role. Eakin is sixth in scoring for the Golden Knights this season, but is seemingly locked into a fourth-line center slot moving forward which doesn’t match up nicely with his contract of just under $4MM. Granger points out that both Reaves’ and Eakin’s contract expires after next season, so moving them may not be hard. However, McPhee could opt to deal from a greater position of strength: Vegas’ surplus of defensemen. The team could try to trade Colin Miller, who costs slightly more than Eakin against the cap and has taken a step back in his development this year. The 26-year-old is signed for three more years, but there are surely teams out there who would still be willing to take a chance on his upside. Other possibilities to clear cap space, albeit smaller amounts, are defenseman Jon Merrill and forward William Carrier. Whatever McPhee decides to do, it is clear that he must move some salary out and the sooner the better once the off-season gets underway. The Golden Knights’ focus is elsewhere right now, but if this promising team is to keep their core together and continue their impressive start to the franchise, they need to do what it takes to keep Karlsson around long-term, even if it costs them in the short-term to do so. Stop us if you’ve heard this one before. After serving a one-game suspension just last week, Ottawa Senators defenseman Mark Borowiecki could be facing more discipline from the Department of Player Safety. He’ll have a hearing with the league today after his illegal check to the head of Cody Eakin last night. This time, unlike his prior incident, the on-ice officials did penalize him, as Borowiecki was given a five-minute major and was ejected from the game. Borowiecki’s recent suspension was for an elbow to the head of Urho Vaakanainen, a connection that he claimed was incidental as he was trying to defend his goaltender’s crease. The league, even while accepting that defense, still issued a suspension and stated that it was Borowiecki’s responsibility to avoid the forceful blow to the head. 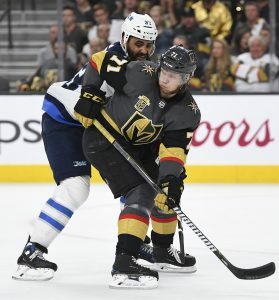 Similar arguments may be made in this incident, as the Ottawa defenseman does little to target Eakin’s head but still ends up connecting with it. The league is putting the onus on the checking player to avoid contact with the head, even if it means avoiding the check altogether. One true and fundamental test of effective discipline is whether the discipline is of sufficient strength and impact that it has the effect of deterring the Player being disciplined from repeating the same or similar conduct in the future. While the two Borowiecki incidents aren’t exactly the same, he was also suspended for boarding Tyler Toffoli in 2016 and is now under intense scrutiny. He may need to change the way he plays slightly to avoid plays like this, even if he had no intent of injuring Eakin. On big open ice hits, there is always a chance that the player’s head is a main point of contact, causing injuries the league desperately wants to reduce. A seemingly innocuous interview with Vegas Golden Knights free agency prize Paul Stastny actually ended up revealing quite a lot about the strange state of one of his new teammates. SinBin’s Ken Boehlke writes that Stastny, while appearing on the Golden Knight’s podcast, was asked who he believes his line mates could be this season. His answer: Alex Tuch and Erik Haula. Stastny made no mention of Vegas’ big trade deadline acquisition, Tomas Tatar, and Boehlke infers that this could mean trouble for the young forward moving forward. 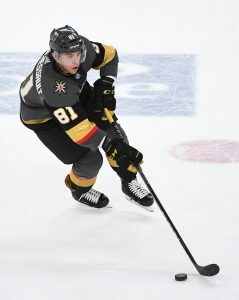 If Stastny’s prediction proves true, then he, Tuch, and Haula would join the surefire top line of William Karlsson between Jonathan Marchessault and Reilly Smith in the Knights’ top six. That would leave Tatar with a bottom-six role and Vegas is not exactly shaping up to have an offensively inclined group in that bottom half. Tatar will be joined by veteran grinders Ryan Reaves, Pierre-Edouard Bellemare, and William Carrier who all seem slotted for a fourth line role. That would leave Tatar with Cody Eakin and one of a number of prospects or fringe players on the third line. Among the candidates are Oscar Lindberg, Tomas Nosek, Ryan Carpenter, Daniel Carr, Tomas Hyka, and Curtis McKenzie. None of that group truly inspires confidence as the final piece of the line with Tatar and Eakin. This begs the question: what role does Tatar have on this team? Even if you don’t put much stock in Stastny’s comments, there is no doubting that Tatar has been less than impressive since being traded to Vegas from the Detroit Red Wings. The three-time 45+ point scorer only registered six points in 20 games down the stretch for the Knights and was a frequent healthy scratch in the postseason, adding just two points in eight games. Tatar is a strong possession player who has proven to be a capable goal scorer in the past, but lacks the two-way game to make a living in a checking role. At $5.3MM, in addition to the trade cost of three high draft picks, it is hard to imagine that Vegas wants to play him in that role either. Tatar needs to find a fit on this roster, either on the second line with Stastny or as a transformative presence on the third line. The Golden Knights are far more shallow up front this season than they were last year and can hardly afford to deal with ineffective or inconsistent play from their biggest trade investment to date. If Tatar does struggle, he may easily wind up wearing out his welcome with the Knights as he did with the Red Wings.